Timothy Burke was appointed to the EIU Board of Trustees in March 2015. Mr. Burke earned his bachelor’s and master’s degrees from Eastern Illinois University in 1971 and 1972. A certified public accountant, Mr. Burke currently is with William Blair & Company in a risk management capacity after having served as a partner and the company’s chief financial officer. Previously, he was with Arthur Andersen for more than 20 years and a partner in the firm’s Financial Services group. While at Andersen, Mr. Burke led a World Bank project in Indonesia to reform the nation’s securities markets. Mr. Burke is a member of the Board of Directors of Health Care Service Corporation, which is the holding company for Blue Cross Blue Shield of Illinois, Texas, New Mexico, Oklahoma and Montana; the Board of Directors of the Mather Foundation; and the Board of the Eastern Illinois University Foundation. He was the president of the Foundation Board in 2012 and 2013. He is a member of the AICPA, Illinois CPA Society, and the Securities Industry and Financial Markets Association. Mr. Burke, originally from Mattoon, and his wife reside in Evanston, Ill.
Minier resident Barbara Baurer was appointed to EIU’s Board of Trustees in April 2017 by Illinois Governor Bruce Rauner. She earned her bachelor’s degree in mathematics from EIU in 1975 before earning her master’s degree in business administration a year later. She served as the Chief Operating Officer for COUNTRY Financial since 1999, retiring in 2015 after providing COUNTRY Financial 37 years of dedicated service. She was the organization’s first female and youngest-ever Vice President when she began reporting to the CEO at age 34 as the company’s Vice President of Management Information Services. In that role, she was responsible for all insurance and investment management operations, information technology services, and the always-open customer service call center. During her career, Baurer served on Boards for the National Association of Mutual Insurance Companies, the Institutes for Property/Casualty Insurance, the Griffith Insurance Education Foundation, the EIU Foundation, EIU’s College of Business Advisory, the United Way of McLean County, and Bromenn Regional Medical System. In addition to the EIU Board of Trustees, she also now serves on the board for FBAlliance Insurance Company. Baurer also received numerous awards and recognition during her career, including the Illinois Diversity Council’s Most Powerful and Influential Woman award, the Griffith Insurance Distinguished Service and Lifetime Achievement awards, the McLean County YWCA Woman of Distinction award. She also is a member of the Illinois State University Business Hall of Fame. Her other EIU distinctions include the EIU Outstanding Graduate Alumni award, the Distinguished Alumna Award from EIU’s School of Business, the Alumni Association’s Distinguished Alumna Award, and an honorary doctorate degree from her alma mater for her commitment to public service. Carl Mito was named to the EIU Board of Trustees in May 2016. Carl is a Managing Director of Investments at Oppenheimer & Co. Inc. He has volunteered in a variety of capacities at Eastern, including as a member of both the School of Business Advisory Board and the EIU Foundation. A five-term member of the School of Business Advisory Board, he was an early supporter of the Securities Analysis Center and later hosted events in his Chicago office to connect business graduates with the University and promote the center’s benefits to students. He and his late wife established the Carl and Marion Mito Excellence in Finance Endowment Fund in 2003 to benefit the School of Business on an ongoing basis as part of his philanthropic commitment. Carl was the recipient of the 2012 EIU Foundation’s Outstanding Philanthropic Award and also the recipient of the 2012 Louis V. Hencken Alumni Service Award. A member of EIU’s Capital Campaign External Steering Committee, which provided guidance as the University significantly exceeded its goal. Carl also delivered the commencement address to EIU’s graduates in December 2011. Having joined Delta Chi Fraternity as an undergraduate, he maintained his connection with that group after his 1972 graduation and assisted with the planning of its 2006 alumni reunion on campus. In addition to his continuing support of EIU, he also sat on the Board of Directors for the Cancer Wellness Center and served on the Executive Committee, Co-Chaired the fundraising committee and led Team Marion for the National Ovarian Cancer Coalition Walk as he continues the fight against cancer. Phillip (P.J.) Thompson Jr. was appointed to the EIU Board of Trustees in January 2017 by Illinois Governor Bruce Rauner. Thompson’s face is a familiar one to the EIU community. He received his bachelor’s degree in sociology from the EIU in 2003 before spending nearly five years as EIU’s alumni events coordinator from 2008-12. He then used the skills he learned and honed at EIU to serve as associate director of alumni relations at Bradley University in Peoria. After that, Thompson moved on to become the director of alumni relations at McKendree University, a private liberal arts institution located in Lebanon, Illinois. Thompson currently resides in Belleville, IL and is pursuing a doctorate degree in Education. Mr. Joe Dively was named to the EIU Board of Trustees in October 2011. He is chairman and CEO of First Mid-Illinois Bancshares Inc., based in Mattoon, Ill. Mr. Dively's business career includes service as a senior vice president for Consolidated Communications and in sales and management roles with IBM and Caterpillar. A Charleston native, Mr. Dively has served his alma mater as president of the Alumni Association, chair of the Business School Advisory Board, and as a member of both the EIU Foundation Board and the Panther Club. He has been an active member of the business community, serving as chair of the Illinois Chamber of Commerce, president of the Charleston Chamber of Commerce, chair of the Sarah Bush Lincoln Health System, and on the board of the Illinois Bankers Association. He received his bachelor of science degree in business from EIU in 1981, and was presented the Distinguished Alumnus Award in 2003. Daniel Caulkins, who was appointed to the EIU Board of Trustees in November 2015, earned his bachelor’s degree in business from Eastern in 1973. Mr. Caulkins has more than 40 years of business and management experience, as well as experience in local government. Currently, he is the vice president and COO of Patterson House Inc., which operates homes for adults with developmental disabilities. In addition, he assists in the operation of Franciscan Properties Inc. in West Chicago. Mr. Caulkins serves on the board of directors of the Central Illinois Capital Development Board and presides over FISH Ltd., a Decatur, Ill.-based civic organization. He is active in the Decatur Area Arts Council and previously served on the Decatur City Council (2005-2009). He is a veteran of the U.S. Army and the Illinois National Guard. Mr. Caulkins and his wife, Jo, have lived in Decatur since 1978. Jan Spivey Gilchrist of Olympia Fields was appointed to the EIU Board of Trustees in May of 2013. In addition to having earned her bachelor’s degree in art education from Eastern in 1973, she was named a Distinguished Alumna by the EIU Alumni Association in 1992 and is recognized on the EIU Notable Alumni website. An award-winning writer and illustrator, Dr. Gilchrist has exhibited extensively throughout the United States, Asia, Africa, Europe and the Caribbean. She has won numerous awards and commissions throughout her career, and has also written and illustrated picture books, including Obama: The Day the World Danced, the first picture book in the U.S. about the historical election. Dr. Gilchrist has also illustrated many of Eloise Greenfield's books, including the acclaimed The Great Migration: Journey to the North. The Girl Who Buried Her Dreams in a Can, a picture book autobiography written by Dr. Tererai Trent, Oprah Winfrey’s “all time favorite guest," was published in Fall 2014. Her collaboration with Ashley Bryan on the book, My America, featured in “The Road to the White House,” has been the inspiration for the Bryan/Gilchrist Collaboration Award, given to the children who can best work together on a collaborative enterprise. She was inducted into the International Hall of Fame for Writers of African Descent in October 2000. She was also inducted into the prestigious Society of Illustrators in 2001. Zach Cohen is EIU’s current Student Trustee. His term began July 1, 2018 and will end June 30, 2019. He graduated from Cary-Grove High School in the northwest suburbs of Chicago and is currently a junior-level accounting and finance double major. He wants to use his time as trustee to expand EIU’s stellar reputation to everyone he can, and to further enhance the university’s standing in the region and throughout the state. As Eastern’s former student vice president of Student Affairs, Cohen understands the role student government plays within a university. 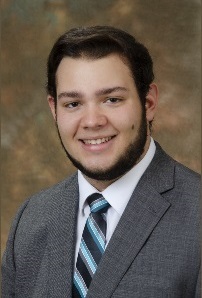 Now, as student trustee, he says he’ll work to ensure the university’s administration keeps the everyday student experience in mind when making decisions that will have an impact on EIU and its primary stakeholders. Cohen said when a friend he knew from high school told him about EIU’s textbook rental program, it sparked his initial interest in the university. After more research, Cohen concluded that EIU was his best-choice option. Looking back, he maintains that enrolling at EIU was one of the best decisions he’s ever made. Cohen plans to graduate in December 2020. In his spare time, he enjoys watching and coaching football and umpiring baseball.